CHRISTIAN24 LIBRARY : WHO ARE THE MOST ADMIRED MAN AND WOMAN IN AMERICA? WHO ARE THE MOST ADMIRED MAN AND WOMAN IN AMERICA? 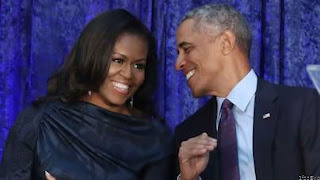 Michelle Obama unseated Hillary Clinton as the most admired woman in the U.S., claiming the title alongside her husband, former President Barack Obama, who has remained the most admired man for 11 straight years, according to Gallup's annual poll. The big picture: Clinton held the title of most admired woman for 17 consecutive years, but this year was surpassed by both Obama and Oprah Winfrey. President Trump came in second place for the fourth year in a row, marking only the 13th time — and Trump's second — that a sitting president didn't top the list since its inception in 1946.